Soul Artist models Eian Scully, Carson Aldridge, and Nate Gill flex and frolic in a range of sporty looks by the likes of 2(X)IST, EFM Engineered For Motion, Lacoste, Marcelo Burlon County Of Milan, Robert Geller, and Rufskin, to name a few. Thanks to men's grooming by Anthony Joseph Hernandez and the styling assistance of Dayne Doyle, this celebration of sport turned out to be a stylish success. The current trend of athleisure combined with the essence of athluxury inspired Victory, my latest fashion editorial featured in the newly-released Paradise-themed issue of Reflex Homme Magazine. 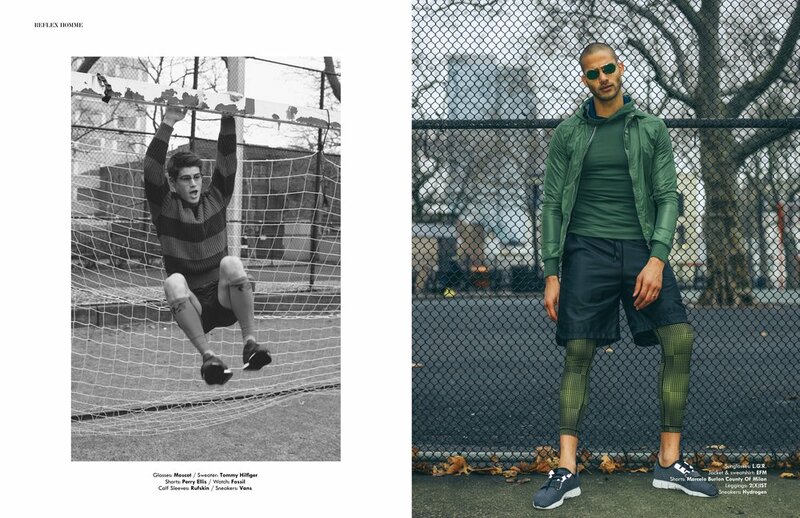 Shot by London-based celebrity and fashion photographer Joseph Sinclair, this 12-page spread was rightfully photographed in the athletic fields of Hell's Kitchen's Dewitt Clinton Park in New York City.